Have you ever wondered about the first service dogs? Who trained them and what types of tasks did they perform? Were dogs considered “family members” as they are today? Or were they nothing more than tools? We thought it would be interesting to take a quick look at the history of service dogs and how their roles evolved over time. Nobody knows exactly when dogs and humans first forged their inseparable bonds. The oldest dog ever found was a perfectly preserved puppy found frozen in the permafrost in the Far East. Scientists estimate its age to be about 12000 years old. We know that Ancient Egyptians kept both cats and dogs and valued them enough to take them along into the afterlife. Dog mummies have been found from as early as the sixth century B.C. and in Peru, a burial place dating back to 900 A.D. holds individual plots for both dogs and their owners. The evidence is strong that dogs have played an important role in men’s lives for a very long time. When, though, did dogs first begin to help those with disabilities? One of the first known references to service dogs is found in Ancient Rome. Frescoes depict blind men being led by dogs and Ancient Chinese scrolls talk of the same. In America, one of the first well-known seeing eye dogs made history in 1928. Buddy and his blind owner, Morris Frank, publicly demonstrated how his dog could guide the visually impaired by having him navigate a busy New York intersection. Since then, guide dogs have been publicly accepted and sought for those with vision problems. It wasn’t until the 1960’s that service dogs for those other than the blind began to be trained and recognized. For the hearing impaired, dogs could signal a crying baby, a telephone, or the sound of sirens. 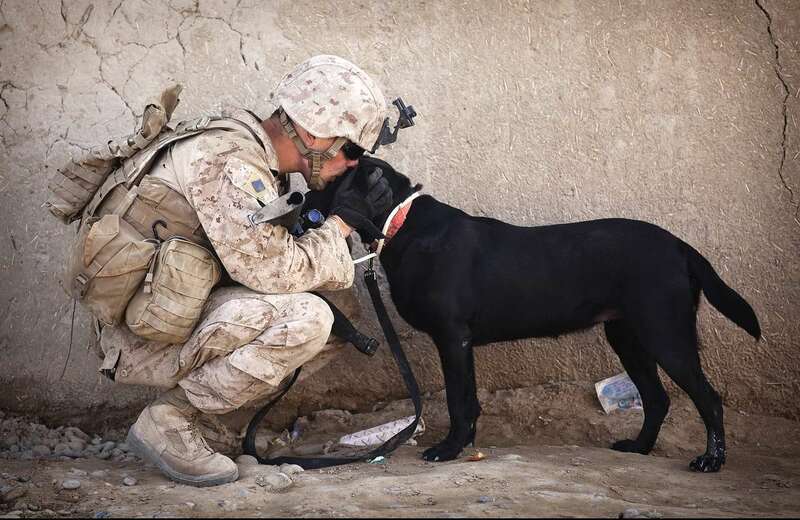 As time went on, dogs became companions for autistic children and soldiers suffering PTSD. Today, a service dog can be trained for all manner of tasks. Recognizing the onset of seizures. Notification of blood sugar issues. But, the role of the modern service dog wasn’t really defined until the American with Disabilities Act of 1990. That particular law was written to prohibit discrimination based on disabilities, but it also defined the rights of service dogs. The ADA defines service dogs (or animals) as being TRAINED to perform tasks for a person with disabilities. They are not just companions, though they also fill that role. Service dogs are caregivers, nurses, and assistants. Today, the role of “service dog” has broadened to the point that new laws are required. Whereas it was once understood, that a service dog was trained to execute a specific task, people will now try to take untrained animals into public access areas. These dogs are often for emotional support as opposed to being trained to perform physical tasks. For those who have invested time and money in their trained service dogs, this can present a source of frustration. Last month, Minnesota made it illegal for people to misrepresent their pets as a service animal. People violating the new law are subject to a $100 fine. Arizona enacted a similar bill, with a stiffer fine of $250. All in all, 21 states now have legislation that penalizes those who try to pass off their pooch as a trained service dog, when in fact they are not. For anyone wanting more information on how to acquire a trained service dog or how you can train your own dog to become one, contact Mike Robertson at College for Pets. College for Pets offers counseling and training classes specifically for handlers wanting to train their own service dog.